An incredible array of artists and musicians honor one of the world's most revered artists, Joni Mitchell, on her 75th birthday on Joni 75: A Birthday Celebration. The all-star tribute salutes Mitchell as a boundary-breaking artist highlighting her songs throughout her career. Featured performers include Brandi Carlile; Glen Hansard; Emmylou Harris; Norah Jones; Chaka Khan; Diana Krall; Kris Kristofferson; Los Loboswith La Marisoul, Cesar Castro & Xochi Flores; Graham Nash; Seal; James Taylor; and Rufus Wainwright. A music icon whose work continues to inspire generations of artists, Mitchell performed on the Dorothy Chandler Pavilion stage in 1972 and 1974, with the Los Angeles Times describing her 1972 concert as "Joni Mitchell in a Giant Living Room." "Our upcoming concerts will mark the return of Joni Mitchell's masterful music to The Music Center, creating both an intimate 'living room' experience and a joyous celebration of her tremendous career," said Rachel Moore, The Music Center's president and CEO. 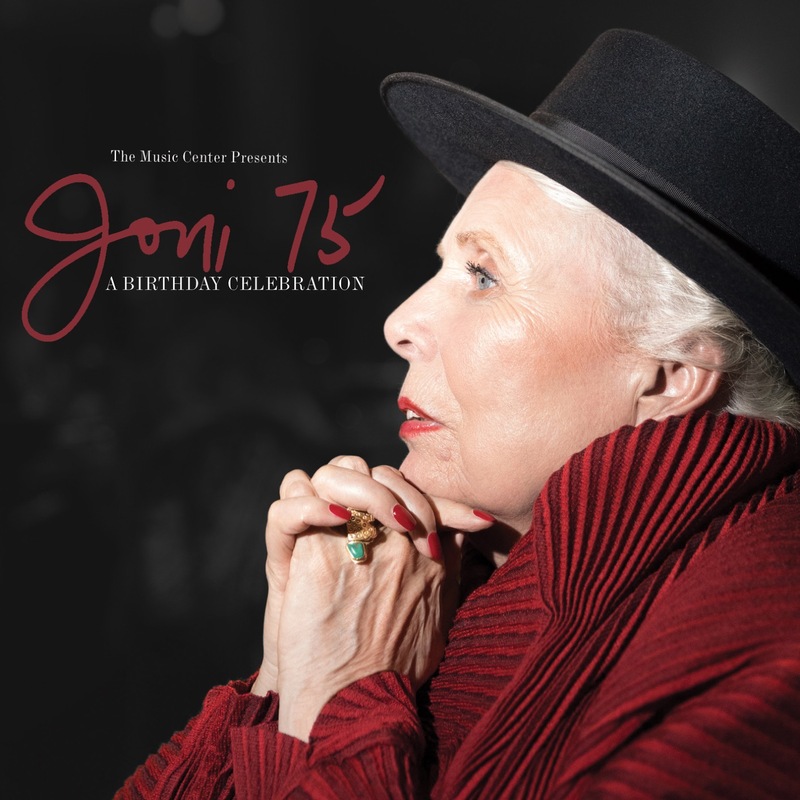 Following the second concert, on November 7, 2018, The Music Center will salute Mitchell on her birthday with The Music Center's Soirée: JONI 75, a special celebration for her and a fundraiser for The Music Center's artistic programming as the organization strives to deepen the cultural life of every resident of Los Angeles County. During the post-performance special event, The Music Center will honor Mitchell with The Music Center's Excellence in the Performing Arts Award, acknowledging her pioneering spirit and timeless art and music. The Music Center first bestowed this award, which salutes individuals who are innovators in the creative and performing arts, upon another great artist - actress, dancer and singer Rita Moreno - in 2016. The Music Center's Soirée: JONI 75 is presented by The Music Center in partnership with Vanity Fair and its editor, Radhika Jones. The Music Center's Artistic Advisor Jorn Weisbrodt is the creator of the two evenings, and Danny Kapilian is the music producer. "Joni Mitchell's songs create sublime paintings of the landscape of human emotions and the mind," Weisbrodt said. "Her view is that of the bird and of the surgeon. There is an unprecedented marriage of intimacy and universality that permeates all of her work. Her art compares to no other, but relates to all of us. A pioneer and builder of her very own tower of song, Joni is a wanderer and a searcher, someone who did not rest but always moved forward, exploring new territory and inviting her audiences to travel on new trails with her. It has been the joy, privilege and honor of my life to develop these evenings for her and consult with her on this voyage. I cannot wait for her and all her friends to experience the magic that everyone on and behind the stage is going to create with her songs," Weisbrodt offered. Los Lobos' Steve Berlin said, "Joni Mitchell is a true iconoclast and has long been an inspiration for us. Her unwavering commitment to expanding her musical vocabulary is something that we've tried to do as a band so it's a huge honor to be part of her 75th birthday celebration." "Joni Mitchell's musical adventure is certainly great, but the more I get to know her as a person, the more I am amazed by the woman herself," explained Rufus Wainwright. "When in her presence, the day dissolves and one glimpses something beyond, something very far away, yet oddly more concrete. Everything about her is oraculous. I'm so very honored to be part of her 75th birthday celebration." "I am very pleased to take part in these concerts honoring my friend Joni, without doubt one of the greatest writers we have," said Graham Nash. Seal said, "Joni is the reason I became a musician, so the opportunity to take part in this means everything to me."